You might wonder: ‘is this a duplicate post? Haven’t we already talked about this bag a few weeks ago?’. No, we haven’t. 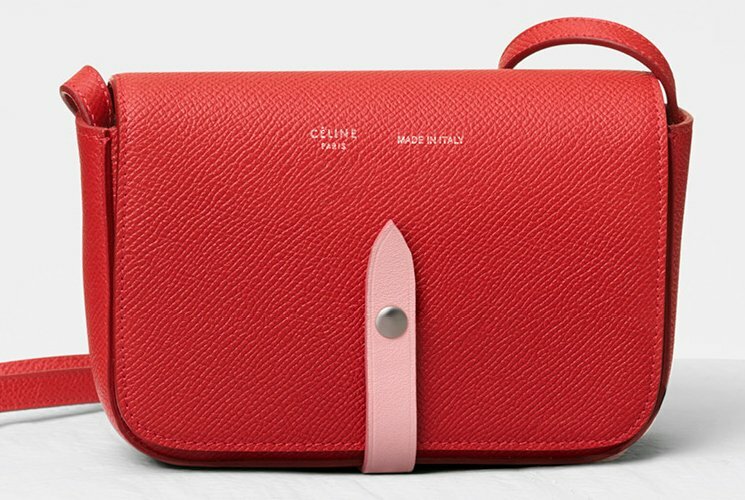 The bag we’ve previously featured is called Celine Clutch On Strap. The Clutch On Strap looks more like the Strap Multifunctional Wallet in terms of shape. It’s also bigger than this version. Now introducing the Celine Strap Clutch for the Winter 2017 Collection. Let’s begin reviewing the design. 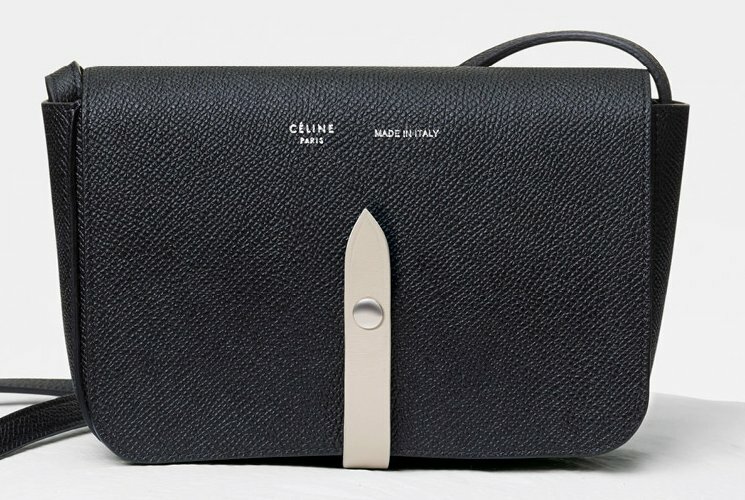 Unlike the Celine Clutch On Strap, the Celine Strap Clutch has curvy edges and is less squared in shape. It’s made to be your cross body bag, but in the size of a Wallet On Chain. It usually comes in bi-color like red with pink strap or blue with light purple strap. The front leather strap is really the crucial component of this design and it functions like a strap closure with snap button. The front is also printed with the house’s signature in mini lettering, it reads: ‘Celine Paris, Made in Italy’, now don’t you love that? 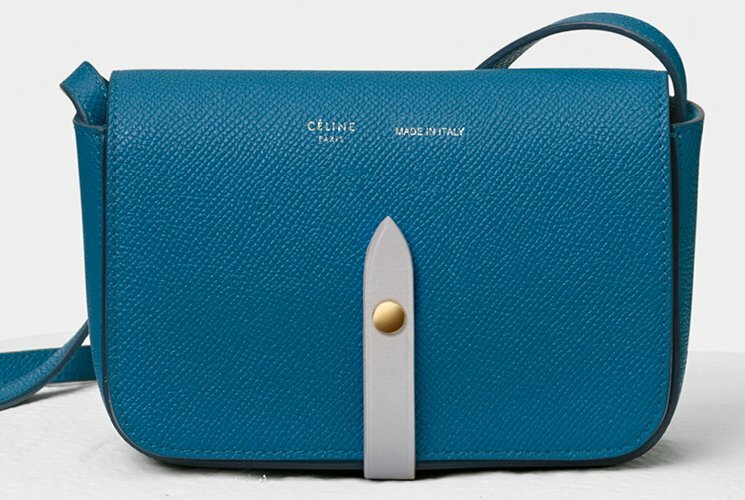 The overall look of the Celine Strap Clutch is not sophisticated, but it’s also not confusing. The minimal design is careful done in bi-color with the strap closure in soft shade that matches to the body of the bag. This bag comes with a leather strap and it’s made from calfskin. Let’s cover the interior, shall we? Open the bag with the strap closure button. Inside you will find the main compartment with a flat pocket. This bag is small, simple but stunning. The colors will easily match with your casual-chic outfit. Measuring 6’ x 4’ inches, priced at $730 USD, €500 euro, £460 GBP, $930 SGD, $5700 HKD, ¥78000 JPY via Celine boutiques.